Two handled bowl with dark brown exterior and harlequin interior. Waverley Antiques 8th Jan 2012. Not Australian and by my definition, not Ramekins, but too cheap to ignore. I have included them because there was an Australian maker who copied, sorry, paid homage to the original design by recreating it. Design copyright was viewed somewhat more flexibly back then. I will trawl through the vast archives at Rameking Central because I have some of them stashed away somewhere. 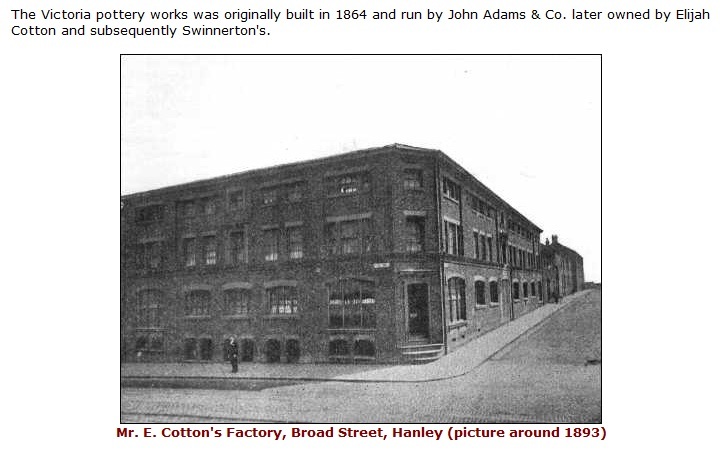 ALB started their factory in 1906 at Hanley, Stoke on Trent. 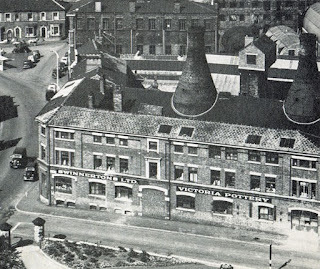 They operated from their works “Vulcan Pottery” in Clough street in the town of Hanley, Stoke on Trent Originally “Smith & Co” from 1882, they commenced in 1919 and closed in 1975 after being taken over by Royal Doulton in 1975. Best known for their “Brown Betty” teapots, they were one of the smaller works in Staffordshire, having around 100 people coming from the same five families. Following the death of B.J Swinnerton, prior to World War One, V.G.H Alcock became Chairman of the Company. During WW1, William Bloor joined the company and the “Washington Pottery” was acquired. In 1925, they bought the “Victoria Pottery, and began making teapots. This was followed by the acquisition of the “Scotia Pottery” in Burslem that also later made teapots. Around this time, a new works for production of Samian and Rockingham teapots was constructed. In 1929, ALB invented a new nozzle for depositing slip on teapots and other items to form a decoration. A redevelopment of the Vulcan works commenced in 1938 and was completed in 1952. This lengthy process was due to the inconvenient interruption of World War 2. In 1952, acquisitions continued with Davidson & Son Ltd, Burslem, (1898-1952) another long established pottery company being purchased. In 1953 the “Washington Works” was sold and in 1959, Swinnertons was taken over by the Lawley Group and the Swinnertons name gradually disappeared. In 1964, ALB. Along with Shore and Coggins, Chapmans and the Paragon China Company became a subsidiary of Allied English Potteries; a combination of the Lawley Group and Thomas C Wild & Sons Ltd. In 1967, Allied English Potteries were acquired by the Standard Industry Group, then in 1971 AEP became part of Royal Doulton and ALB closed in 1979. Royal Doulton then became part of “Steelite International”. Their Chief Executive is a former Royal Doulton employee. Just found this while looking for mine online that I am selling. I really want to hang onto them but you can't keep everything can you (?). They are great colours. I have a set of ALB ramekins. I live in the USA and have tried to find them here. I have never found these anywhere except Australia. They must have been an export for your market. The ones I have, I purchased through the ebay Australia site.